Steiner Optics 539 Military R LPF 7x50 Model 539 Binoculars FREE SHIPPING! 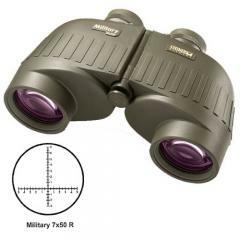 Steiner Military R LPF 7x50 Model 539 Binoculars are built for durability and performance. Made from fiber-reinforced polycarbonate, they come with webbed thermoplastic rubber armoring for enhanced impact and drop resistance. The objective lenses feature tethered eyecaps for protection, and feature a special filter for protection against lasers. The nitrogen fill prevents water intrusion and fogging in all temperatures. The unique two-part construction method directs forces away from the optics to protect them from damage, and also allows both halves to be swiveled around the central axis to change interpupillary distance. The multi-coated optics provide maximum light transmission even in low-light conditions, producing a bright, high contrast image. The built-in rangefinder reticle is easy to read in daylight and artificial light and makes accurate distance estimation simple. ©2002-2019 CopsPlus.com: Steiner Optics 539 Military R LPF 7x50 Model 539 Binoculars FREE SHIPPING!